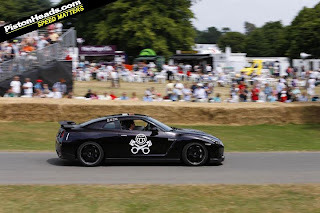 Pistonheads got a chance to get in a Nissan GT-R SpecV at Goodwood this last weekend. The plans for the SpecV sales in the UK have not been announced, but this particular car had been at Nurburgring testing. European marketing manager Simon Croft drove the car over from Germany for the event (he’s making the return trip today), but even he wouldn’t be drawn on the prospects of this £100k-plus car coming to a showroom near you anytime soon; ‘the numbers are still being crunched’ remains the official line. 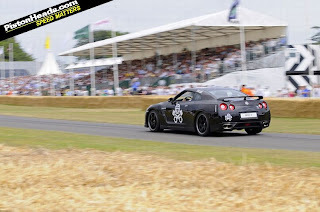 I think that even a quick run, or a ride in a SpecV at Goodwood sounds like fun. Interesting "skull and crossbones" graphics. Smiley face and pistons.It looks familiar. First up is a set of carbon brakes, which have been reported elsewhere as costing an eye-watering £35k on their own – apparently due to higher carbon content than ‘ordinary’ carbon-ceramic discs as fitted to Porsches, Lambos, etc. Next is a turbo-boost button on the steering wheel which gives you an extra 14lb ft of torque for 80 seconds in any gear above third, while other performance mods include a new titanium exhaust with quad tailpipes that save 6kgs of weight over standard, plus a new front splitter, carbon rear wing, new rear diffuser, and black RAYS wheels with bespoke Bridgestone tyres.